Cyril Phan is a French graffiti artist born in 1969, better known under the internationally pseudonym of Cyril Kongo. 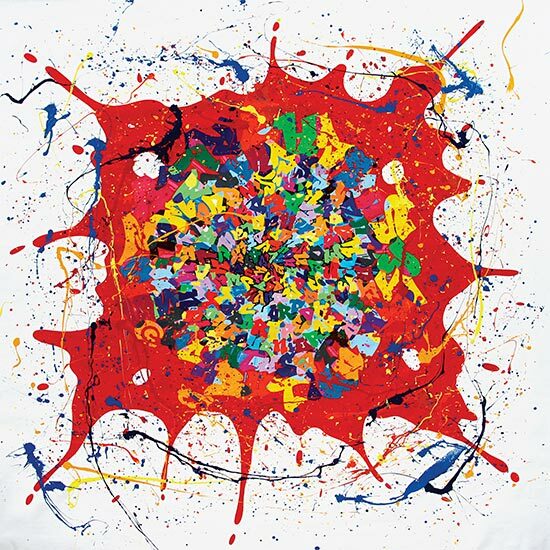 A self-taught painter established himself as one of the leading figures of the graffiti art scene. His works are now part of important private collections. Born to a Vietnamese father and French mother, after the fall of Saigon in 1975, the artist lived two years in the Republic of Congo (hence the pseudonym) with his mother. 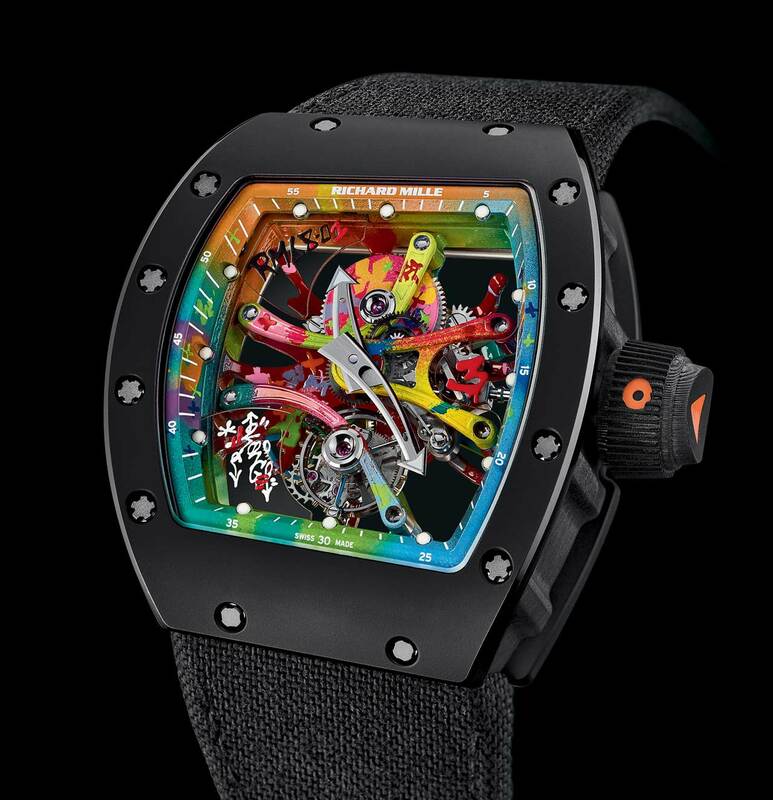 Reflecting his desire to introduce contemporary art within haute horlogerie in an unprecedented manner, Richard Mille asked him to transfer his universe of the tremendously large to the heart of a watch movement. 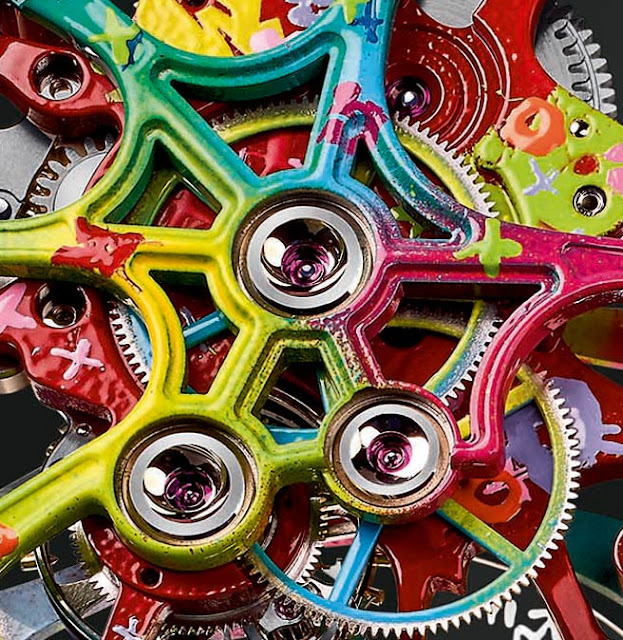 From city walls to the horological world of micromechanics. A highly complicated tourbillon calibre was transformed in a canvas for the inspiration and creativity of the artist. This way, Cyril Kongo’s work of art has taken shape on the bridges and baseplate of a watch, becoming a truly integral part of the timepiece. The result is the surprising Richard Mille RM 68-01 Cyril Kongo. It took more than a year to develop the painting technique used by Kongo. A special airbrush was developed to allow the artist to spray his colours with the utmost delicacy, one droplet at a time. The risk was to impact the delicate calibre’s equilibrium, essential to its functioning, the weight of the paint had to be strictly determined beforehand. Kongo explains: ‘It took the development of special tools, and over a year of experimentation for me to be capable of painting on a watch some five centimetres (two inches) square. Certain pieces were barely a few millimetres long, some even smaller, and I had to put the lettering directly on them, enough for visual effect but without using much paint so as to avoid throwing off the balance of the movement”. 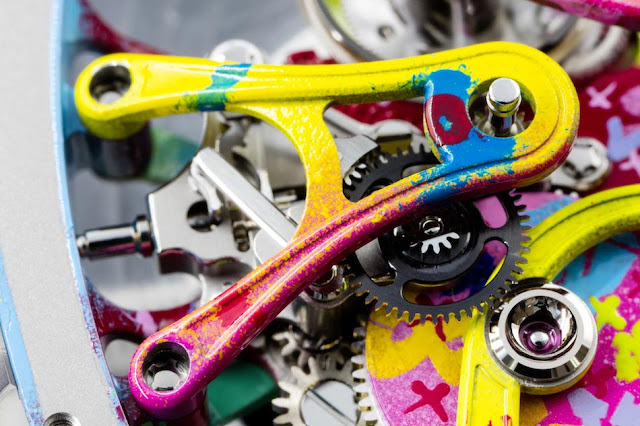 On the back of the watch, the central form of the tourbillon movement’s baseplate radiates outwards like a splash of paint physically thrown against a wall, while from the front the different movement bridges can be seen arcing in different directions like the wild brushstrokes found in street art murals. The 3 Hz (21,600 vph) hand-wound movement is housed within a case comprising an NTPT Carbon caseband with black ceramic bezels (you can read more about the use of high-tech materials in Richard Mille timepieces here). The asymmetric case design tapers in two directions—in thickness from 9 to 3 o’clock and in height between 12 and 6 o’clock. Richard Mille RM 68-01 Cyril Kongo. 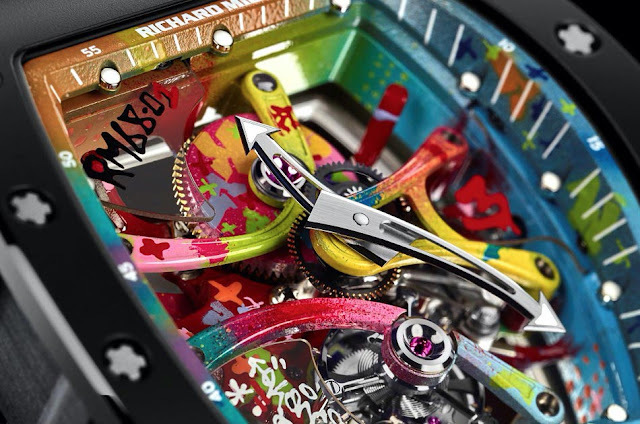 A highly complicated tourbillon watch was transformed in a canvas for the inspiration and creativity of the artist. 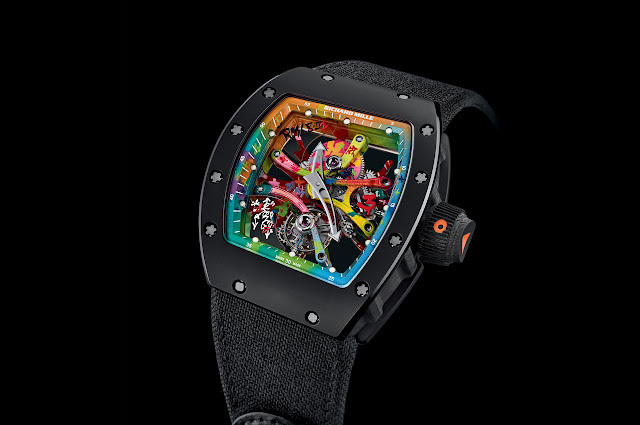 The result is the surprising Richard Mille RM 68-01 Cyril Kongo. 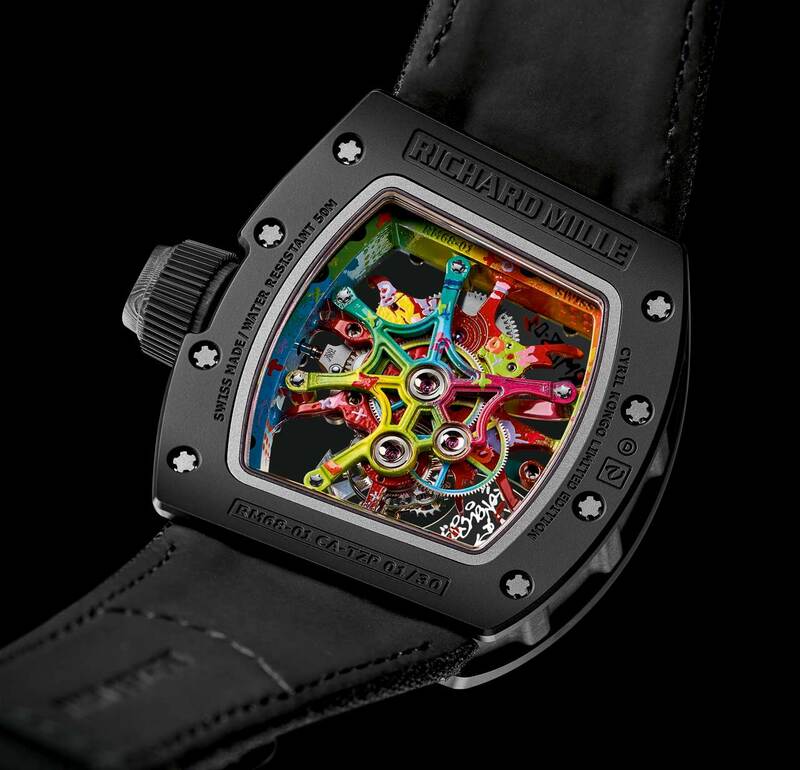 Available exclusively at Richard Mille boutiques worldwide, the Richard Mille RM 68-01 Cyril Kongo will be produced in a limited edition of just 30 pieces, each of them truly unique. The price before local taxes is around Euro 700,00 / US$ 685,000.